Sept. 1, 2011, 2 p.m. The Winnipeg Free Press’s cafe has increased reader engagement, helped social media efforts, and apparently made some fine sandwiches. By Tim Currie @tscurrie Sept. 1, 2011, 2 p.m.
Not long ago, the Winnipeg Free Press’s social media editor hosted an online chat from her desk at the paper’s downtown news cafe. She had done it many times in recent months but something unexpected happened. The experience highlights the challenges and rewards of the paper’s effort to host live events online and in-person at its news cafe — increasingly in tandem. The Free Press cafe recently hosted an interactive town hall breakfast meeting with Manitoba’s premier and a lunch hour chat with the executive leading the construction of Winnipeg’s new Canadian Museum for Human Rights. These live events are in addition to other events journalists have recorded at the cafe and posted later online, such as a series of interviews with comedians playing the city’s comedy festival. The episode also underscores the paper’s changing role as it tries to push some of its newsroom presence out of its suburban office building and into the public, physical realm of its downtown cafe. It’s showing the public how the sausage is made, using more than just the online tools favored by many news organizations. The Free Press was the first newspaper in Canada to launch a news cafe, and it may be the largest paper in North America to do so. The Free Press, Winnipeg’s largest daily, has a Monday to Friday circulation of 115,827. Winnipeg is Canada’s eighth-largest city, with a population of 753,000. Wiebe and two colleagues — multimedia reporter Tania Kohut and multimedia editor Tyler Walsh — are based full-time in the cafe. Their desks sit on a low riser in a bright corner of the coffee shop, situated in the historic building the Free Press took over five months ago. Lights and TV monitors on the stage frequently grab the attention of people walking by. Street-level news studios aren’t a new concept, of course. Toronto broadcast entrepreneur Moses Znaimer pioneered the store-front television studio with Citytv in the 1980s — but the audience watched from the sidewalk. The open, walk-in-and-chat newsroom is still a rare commodity. In Connecticut, Journal Register’s The Register Citizen has been experimenting with open access to reporters via its news cafe. Other news organizations have hosted one-day news cafes or experimented with stationing single reporters in existing coffee shops. 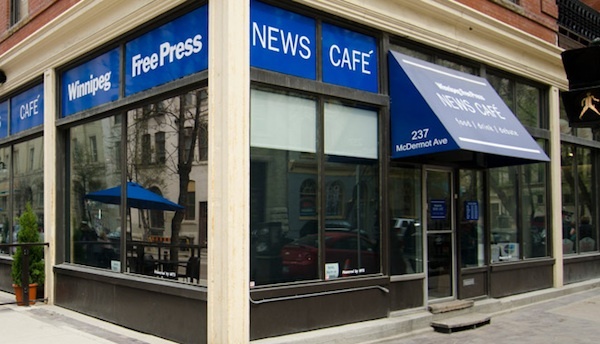 In Winnipeg, the cafe hosts the paper’s online staff in a Free Press-branded full-service restaurant in the heart of the city’s busy Exchange District. Office workers pack the cafe during the lunch hour, attracted by the menu of local organic fare, such as Kohut’s favorite, the Manitoba Club, topped with bacon from a nearby farm. So, how do the journalists get any work done? “People ask me that a lot, actually,” said Wiebe. The Exchange District is an older downtown neighborhood of renovated warehouses that house design studios, art spaces, and a film production company. The area is popular with a younger crowd, according to White, and the news cafe’s presence there — a partnership with an established cafe operator — is no accident. While its broadcast competitors have had a downtown presence for years, the Free Press, like many papers, left downtown decades ago for cheaper land in the suburbs. This small move back downtown, not far from its original historic building, is a chance to take on those competitors by building the Free Press’s video brand at a community level, says Walsh. But the prospect of “sitting right there” and taking audience complaints didn’t appeal to some Free Press staffers, well acquainted with the kind of responses stories can get in online comments sections or by phone. Journalists at other cafes have pointed to the prospect of gaining story ideas from cafe-goers as a key benefit. Wiebe says she has received some story ideas, but the increase in audience feedback and interaction has been the most important aspect. She recalls the day the Winnipeg Jets released the team logo for their new-again NHL team. Walsh put the logo up on the monitor for everyone in and outside the cafe to see. POSTED Sept. 1, 2011, 2 p.m.
Currie, Tim. "Chats don’t have to be online: A newspaper finds success with its downtown news cafe." Nieman Journalism Lab. Nieman Foundation for Journalism at Harvard, 1 Sep. 2011. Web. 20 Apr. 2019. Currie, Tim. "Chats don’t have to be online: A newspaper finds success with its downtown news cafe." Nieman Journalism Lab. Last modified September 1, 2011. Accessed April 20, 2019. https://www.niemanlab.org/2011/09/chats-dont-have-to-be-online-a-newspaper-finds-success-with-its-downtown-news-cafe/.